In its simplest terms, social listening is the practice of monitoring audiences on social media platforms to find out what is being said about your brand or your marketplace as well as to identify topics of discussion, opinions and new trends. The influence that social media has on our lives is huge and it is probably fair to say that it is now the primary news source for a large percentage of the population. For this reason alone it is impossible for both businesses and agencies like us to ignore. When we expand into what exactly social listening is we find that it is a method that allows the user to identify all of the social chatter around their brand and focus in on the most important aspects of these conversations. This can include, and is not limited to, positive feedback, negative feedback, customers’ questions and queries, product reviews and suggestions. 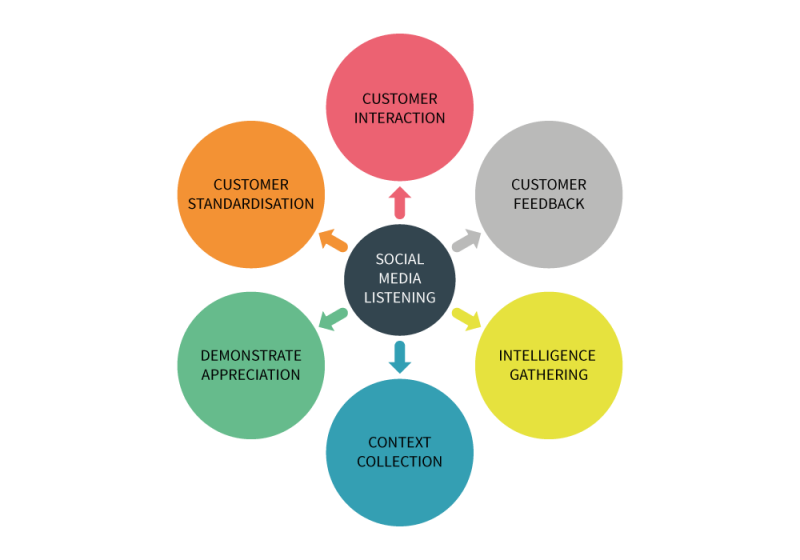 In order to implement an effective strategy you must look how social listening affects each area of your work. If you can do this analysis then the results will surely come. Over the remainder of this blog we’ll look at the role social listening plays across ‘digital’. Search engine marketing (SEM) is one of the areas that is least associated with social listening but in truth can be most affected. Social posts and indeed pages are now increasingly frequent in search engine results pages (SERPs), often occupying some of the most coveted positions. The impact that the social search results can have on organic listings is huge and it is essential that you have a team that is not only prepared for this but that they are listening to what is being said and way you are appearing for certain queries. The two main benefits of social listening in relation to SEM are that you are able to monitor the talk around your brand to identify new content ideas based on what your customers are talking about. This often leads to valuable new optimisation opportunities that your competition may not have realised and where you can steal a march on them. The second benefit is that you are able to protect the brand and the reputation of the company in terms of any negative post that are made. By responding to reviews, complaints and queries quickly you can negate the risk of having negative sentiment appear high in SERPs. SEOs can also use social listening to help them to identify new keywords. They can pick up on new trends and products and what the searcher is looking for and they can add these into their keyword planner and content strategy. They can also pick up on terms with negative connotations and remove these from their strategy by adding them to a list of negative keywords. In terms of SEM there is also a case for those working on the paid search side of things to pay attention through social listening. These teams should utilise the data gathered from social listening to highlight their brand’s strengths and their competitors’ weaknesses. A long term strategy could be to identify key pain points of a competitor’s product and building landing pages and ad copy which highlight the competitor weaknesses with their brand’s strengths. In relation to a short term strategy you could target ads to those who are looking for a certain product with the competitors but who are complaining that it is not available. The same can be said for those that are dissatisfied with a competitor. For those working on the display side of marketing, social listening can be a powerful tool as it can give an insight into where to target their buys. By monitoring where current customers are spending their time online and what they are talking about they could lead to interesting discoveries. Social listening allows them to identify common themes or interests amongst their customers and then apply that learning to their buys by targeting sites based those keywords and interests mentioned in the social channel. Additionally, most social listening platforms include a tool that identifies brand ‘influencers’. Many of these influencers are bloggers with sites that are extremely relevant to their audience. If people working in this area collaborate with their creative team they can build a message and campaign that resonates with their customer base. After highlighting the many ways that you can use social listening through various digital media channels, we will now look at some of the best practices on how to use and implement social listening. Contemplating to choose a social listening platform for your business? First, identify what you are actually going to measure, because every successful social media campaign are based on clearly defined objectives and measurable outcomes. Some of the most prominent measures are reach and influence over your community, social media engagement, competitive data, customer sentiment about your brand, and sales conversions. It is important to know the budget your business is ready to allot for social media listening or monitoring. Simply speaking, the cost estimate for implementing social media listening for your business depends upon the amount of data you need to collect and archive for analysis. Apart from tracking and storing data related to social listening, there may be other features and functions that can boost expenses. Google Alerts is one of the best free tool to monitor your brand terms across the web. Regular social media monitoring is a good way to learn more about your audience and how people in the social media arena are reacting to your brand. It can serve as an organic focus group to gauge customer feedback, new marketing ideas, and solve current problems. It’s no surprise that the more you monitor, the better connected you can be with you customers and the potential customers interested in your brand. In addition to regular monitoring, setting up alerts is another key strategy to track social listening. This allows businesses or users to set up queries that monitor spikes in social conversation. These spikes can be caused by industry changes, product launches, product failures, etc, but are important pieces to keep track of. Doing this can help a brand quickly react to any negative backlash as well as determine what early adopters are saying about a newly released product. Monitoring positive or negative sentiment pertaining to a brand’s top competitors is another useful strategy that can be accomplished through social listening. This knowledge can help guide keyword expansion and ad copy within the search campaigns and differentiate you as the better alternative for consumer needs. According to Moz, there is no end to the testing phase and you should always keep asking questions like the ones below to fine tune your strategy. Who are your customers mainly – the social audience and target market? Is your social media platform meant just to monitor (listen) social media mentions or also manage social media profiles? Identify the profile you are most active on. Does your chosen social media listening platform support that network? Do you to archive data for analysis – for how long? Are you also looking for sentiment analysis in your listening platform? Are you looking for listening platform to integrate with other tools like Google Analytics, etc? Click Consult is an award winning search marketing agency committed to leading and communicating industry best practice, to find out what Click can do for your brand – contact us today.